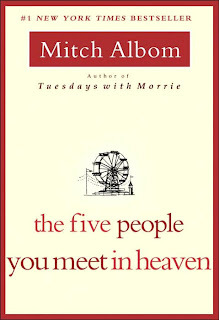 The Five People You meet in Heaven is an amazing story that is perfect for all kinds of readers. It is short and simply told, but the book makes you think long after you are done. In the story, Eddie, a simple, but dignified man, dies unexpectedly while trying to save another and ends up in heaven, but its not anything like what he imagined it to be. While there, he is greeted by five people who have been waiting for him, so that they may explain the importance of his life and how it's related to their own. This is the only way he can acquire true peace. At all times, this heart-warming tale encourages you to read further, and it is perfect for all. It would appeal to any and every adult, boy, or girl who enjoys reading a story with true meaning.